Those who read Mark Glancy’s 1999 study, When Hollywood Loved Britain, will be eager to come to grips with his newest chronicling of how the ‘special relationship’ has functioned – and fluctuated – over the years. The earlier book made a case for the representation of Britain in a stream of highly successful Hollywood films as varied as Lady Hamilton, Mrs Miniver and Rebecca, and many others which often seemed to be working as recruiting officers for American support for Britain’s war effort. 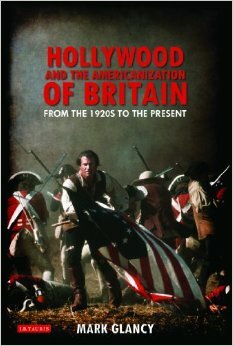 But as well, Hollywood knew on which side its receipts were buttered: that is, the important fact of Britain as its chief source of ‘foreign’ revenue, and this continues to be a major preoccupation of Glancy’s new book, Hollywood and the Americanization of Britain. Then as now, it wasn’t a matter of Hollywood’s offering Britain congenial images of its ways of living and thinking out of sheer admiration. With its eye firmly on box-office it wasn’t about to offend so lucrative a market. When it did so, with Roland Emmerich’s block-buster manqué, The Patriot (2000), it came a cropper in Britain. To put it simplistically, if the earlier book explored how Hollywood showed that it ‘loved’ Britain, the new one offers a superbly documented study of how Britain reciprocated over a tumultuous eighty years. As before, Glancy brings an impressively even-handed analysis to his material, and, speaking of his ‘material’, this covers not merely a vast range of film-viewing but an enormously thorough exploration of how this source material was received by a comparably vast range of viewers, from those in ‘industrial halls’ to mandarin critics. Glancy’s Introduction offers very clear statements of his intentions and the means by which he plans to execute them. He writes: “At the core of the book, and the research process that has informed it, is an interest in audience tastes, preferences and attitudes, and a curiosity about the meanings and pleasures that British audiences have found in Hollywood films.” (3) He is not setting out merely to record commercial success or failure, or to either criticise or celebrate the prominence of Hollywood cinema in Britain. Rather, he sees this presence as an indubitable fact that is worth pursuing as part of “a hidden history”of British cinema. He seeks to undermine clichéd responses, such as the official line about the deleterious effect of Hollywood gangster movies on impressionable British youth, by examining a wide spectrum of attitudes. Critics in the middle-class newspapers are not necessarily a reliable guide to how large cinema-going audiences are reacting. The attitudes of these latter are convincingly canvassed through careful sifting of the content of popular magazines such as Picturegoer and, to bring up to date this demotic approach, through the online sages whose views are to be found on IMDb. Glancy doesn’t fall for the line that British audiences ever became even “temporary American citizens”; he seeks to establish just what they found attractive about Hollywood films, and this leads him to focus in each chapter on either a particular film or genre or star of significance and to avoid easy and unhelpful generalisations. He is not setting out to “prove or disprove that Hollywood films have been the agents of Americanization; the concept is too nebulous to be absolutely confirmed or denied… my interest is instead to determine how and why Americanization became so closely identified with films, and to investigate the extent to which issues of nationality figure in popular film preferences.” (10) There were fears from both Right and Left; there were anxieties from within the struggling British film industry; but again and again the book’s concern is to understand audience preferences and their sources in the Hollywood product. The focus in Chapter 2 is on the phenomenon of Rudolph Valentino’s star appeal in the 1920s. Drawing on popular magazines, he considers such notions as Valentino’s combining a whiff of the exotic with a transnational attractiveness, especially to women, who flocked to his films – and to the cinema in general – as a social relief from home duties. This chapter is full of astute perceptions about what is to be learned from investigating a journal such as Picture Show, a cover of which featured him in three poses, suggestive respectively of casual Americanness, upper-class Britishness and Native American bravery. The interplay of passion and restraint in the images he presented fed easily into the developing fan culture of the 20s. After trawling through the values represented in Westerns, and how these were received by British audiences, whether at ‘B’-movie level or in the top-drawer success of The Big Country(1958), and through how Grease (1978) pulled in cinemagoers old enough to remember the 1950s with nostalgia and their teenage children who found in it an appeal that transcended time and nationality, Glancy brings his exploration to a close with a detailed inquiry into the curious reception given to The Patriot. Film depiction of the War of Independence posed problems for filmmakers with their eyes on British markets. The author traces the ways in which American film versions of British subjects such as Robin Hood or the mutiny on the ‘Bounty’ had been made palatable to British audiences, but the War of Independence was something trickier to sell, in Britain anyway. The Patriot characterises this war as one “in which peaceful Americans were roused to fight against tyrannical British rule” (258), not, as some earlier films set in this conflict were, as one between “two groups of Englishmen”. The times had changed since Hollywood was selling such laudatory images of Britain as Mrs Miniver, and it was perhaps not surprising that The Patriot fared badly at British box-offices. But was its relative failure wholly attributable to its ideological content? As Glancy suggests, perhaps star Mel Gibson’s plummeting reputation contributed to this. Throughout this admirable book, he maintains an objectivity that doesn’t preclude enthusiastic engagement with his subject but which wins the reader’s respect and that permits a subtly analytic approach to what are often extremely complex issues. The quality of the research is remarkable (the one tiny error I found [see p.178] – Patricia Roc was not in The Man in Grey nor Stewart Granger in The Wicked Lady – is almost shocking in its solitariness! ), and the whole is written with a clarity and accessibility not always seen when film scholars take to the page. It is an important contribution to the writing about British film history.